Ohio Wesleyan University and the City of Delaware celebrate a new memorandum of understanding signed on Thursday by OWU President Rock Jones (seated left) and City Manager Tom Homan (seated right) that creates a permanent student internship in the city’s Department of Public Utilities. On hand for the signing are professor John Krygier (standing left), OWU environmental studies students, and Caroline Cicerchi, the city’s watershed and sustainability coordinator (standing right). 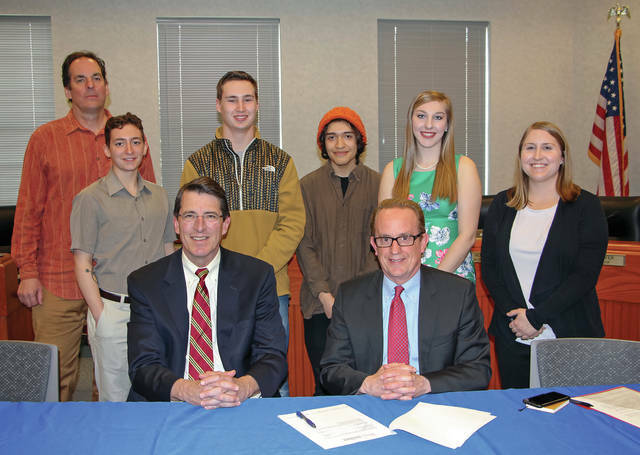 Ohio Wesleyan University and the City of Delaware signed a memorandum of understanding on Thursday creating a permanent OWU student internship within the city’s Department of Public Utilities and formalizing additional opportunities for city-campus collaboration. The agreement creates one public utilities internship each semester for which the selected Ohio Wesleyan student will receive course credit. The agreement also establishes formal opportunities for OWU faculty and students to work with the city on research and other projects of mutual interest. Students selected for public utilities internships will work an average of eight hours a week for 15 weeks and gain practical knowledge in watershed planning, water-quality monitoring and improvement, stormwater management, geographic information system (GIS) equipment, grant research, and more. They also may become eligible to earn certification in environmental fields, expanding their ability to compete for jobs when they graduate. To create the new memorandum of understanding, Krygier, who also serves as co-director of Ohio Wesleyan’s Environment & Sustainability Program, collaborated with student Janelle Valdinger, a sophomore geography major and full-time City of Delaware Public Utilities employee, and with Caroline Cicerchi, the city’s watershed and sustainability coordinator. “The city’s Public Utilities Department has relied heavily on its partnership with Ohio Wesleyan University students in recent years from volunteering at watershed programs to conducting water quality samplings,” Cicerchi said. “They are an invaluable partner to our department and the city overall. I am thrilled to formalize our partnership in a way that benefits students, faculty, and city departments alike. The memorandum was signed Thursday by Delaware City Manager Tom Homan and Ohio Wesleyan President Rock Jones with Ellis, Krygier, Cicerchi, and other city and university representatives witnessing the event. Ellis said she hopes more such agreements are forthcoming. “As we continue to expand internship, externship, mentored research, and other opportunities for Ohio Wesleyan students through our OWU Career Connection Office,” Ellis said, “we hope this memorandum will serve as a template for future agreements. Learn more about the City of Delaware’s Department of Public Utilities at www.delawareohio.net, more about Ohio Wesleyan’s Environment & Sustainability Program at www.owu.edu/environment, and more about the OWU Career Connection at www.owu.edu/careers.